Cosmic Creamery was born when founder Kelly Berger began to make ice cream for her friends on their birthdays. Each person was allowed to choose their own flavor, and even encouraged to pick things they hadn’t seen before as ice cream. In a whirlwind year of recipe research, churning familiar favorites such as mint chocolate chip, strange requests including candied olive ice cream, and changing recipes to account for food allergies, She had very few culinary disasters. Kelly’s birthday gifts to her friends were a big hit and she amassed a large assortment of ice cream and sorbet recipes. Some were from books, some from the internet, and some she developed herself. To no one's surprise, her friends were clamoring for more. After a lot of reading and business planning, Kelly decided it was time to take her ice cream making addiction past hobby status. Making ice cream and developing new recipes was fun, hammering away at a business plan was much less fun, but necessary. 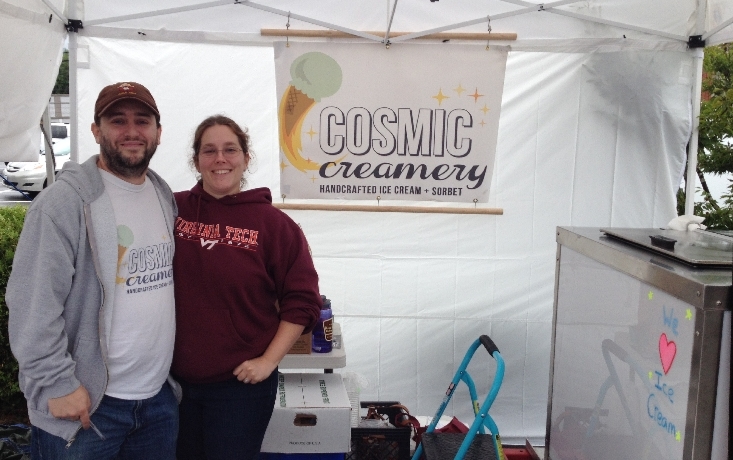 Once she was prepared, Kelly sought out financial support to make Cosmic Creamery happen. One too many banks politely and not so politely told her that she would need to be in business for at least two years before they would agree to a “start-up” loan. Kelly took her ice cream plan to the internet. She ran a successful crowd-funding campaign through the website Kickstarter and received the capital to make Cosmic Creamery a reality. Commercial kitchen space was leased, an insulated ice cream cart was purchased, and three different ice cream machines started churning out delicious desserts in the spring of 2013. 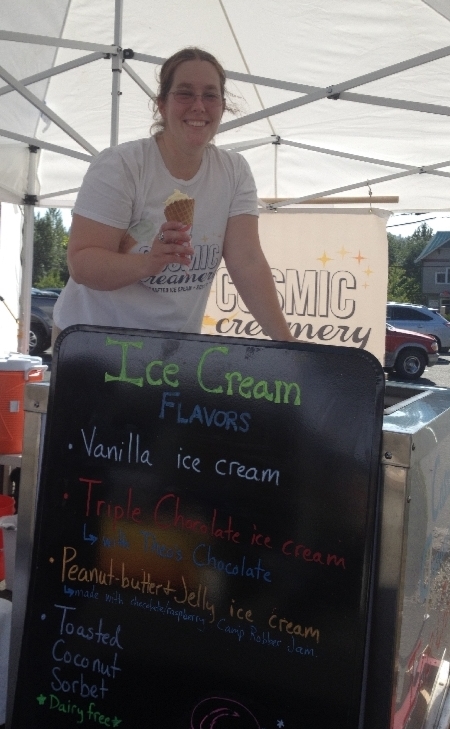 Today Cosmic Creamery is in its second summer of ice cream sales at farmers markets. Kelly and her fiancé Adam Faber spend a few days a week making ice cream and sell it at two weekly farmers markets. 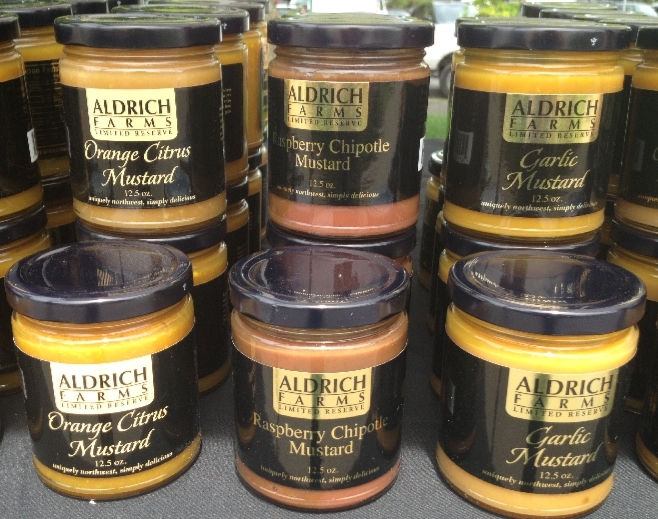 As many ingredients as possible are purchased from Washington state farms, dairies, and companies. “We live in an incredible state for a bounty of food!” Kelly explains. While ingredients like tropical fruits still have to come from elsewhere, most of Cosmic Creamery’s ingredients are purchased at farmers markets. 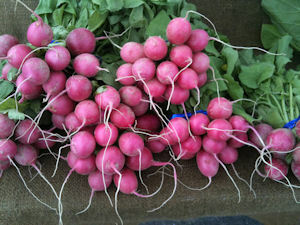 “It’s so much fun to see what produce is in season at the markets and take advantage of that freshness. It always tastes better.” Buying local food and supporting Washington communities is one of the principles that Kelly built Cosmic Creamery around.